Finding that all the new music I hear sounds like the regurgitated and repackaged music of my teens and twenties, I’ve hung up my indiepop rollerboots and am off to explore pastures new. When I say new, I mean new to me – the stuff that’s currently floating my boat is centuries old, and I’m talking Baroque. You could put this shift down to my age, but actually it’s exposure to my son’s musical tastes that’s flicked the switch. In classic ‘Absolutely Fabulous’ fashion, he resisted the alternative rock and indie stuff that we were heavily into when he was growing up, choosing instead to immerse himself exclusively in the world of Classical music. I’m not a total novice to Classical (or in this case, Baroque) music, but my knowledge is pretty scant. Regular listening to Radio 3 is helping, but I want to have a greater understanding of the history of music and a clearer sense of who wrote what and when. I want to know what was going on at the time of writing – both politically and artistically, and also, what inspired these composers to create such incredible works. Clearly, a book purchase was in order. I went for a tried and tested classic as a good place to start. If the reviews are anything to go by, Harold C. Schonberg’s ‘The Lives of The Great Composers’ is the go-to compendium of the history of Classical music. At over 700 pages, it’s not light, but from what I’ve already seen, it’s an engaging read, both intelligent and witty. 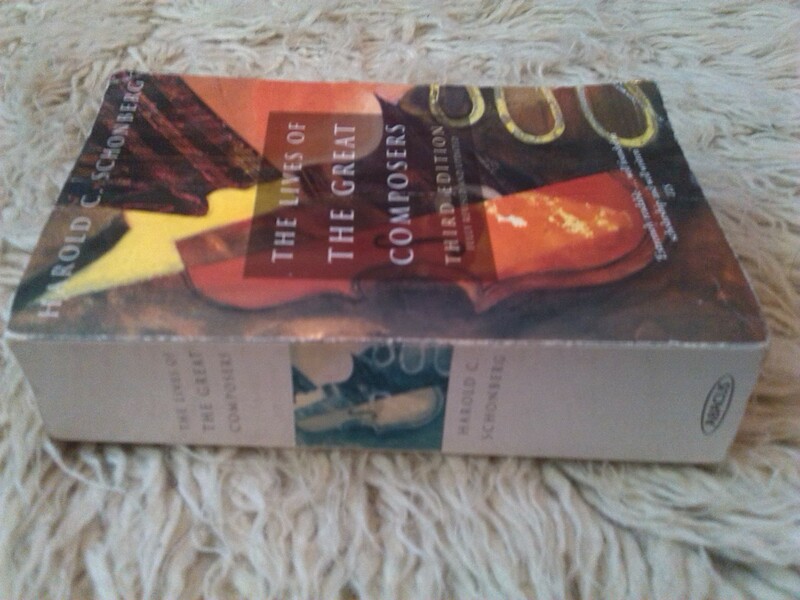 With this tome at hand, I’ll be well on my way to becoming a Classical bore in no time. Consider yourselves warned. 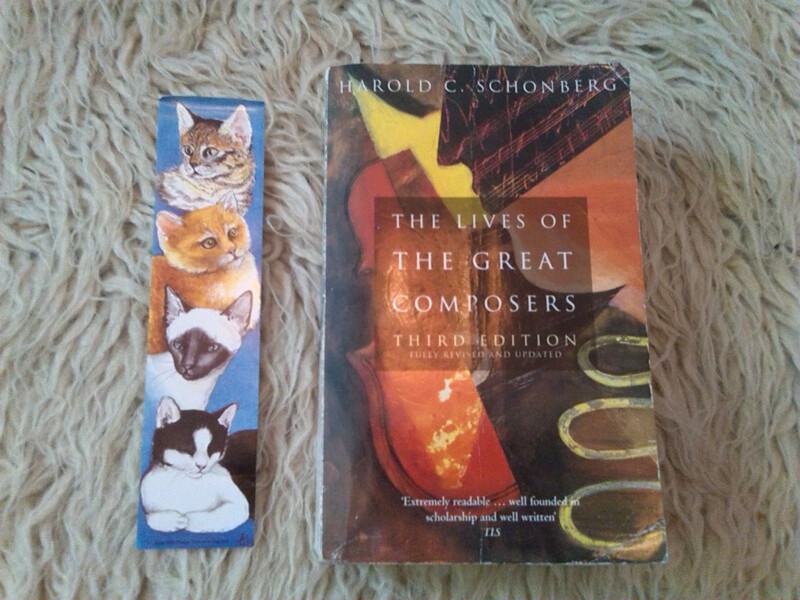 There’s only one thing better than a great secondhand book, and that’s a secondhand book with a free cat bookmark inside – win! I have a few scrapbooks filled with things I’ve found in secondhand books. I thought that was going to be my blog, but I found someone had already done it and in a whole lot more detail than I had. Photos. Publishers. Etc. And now… I’m so glad because I’ve had my photo blog since the end of 2009. Yay! I think this post deserves an award for the best title ever! I love *some* classical music, but I’m totally ignorant about musical theory – I just listen to what I like! Why, thank you! I currently feel like I’m flailing around in Classical soup although listening to a lot of Radio 3 is helping me get a sense of what avenues to pursue. I’m very much a learner still, but I’m enjoying the trip!